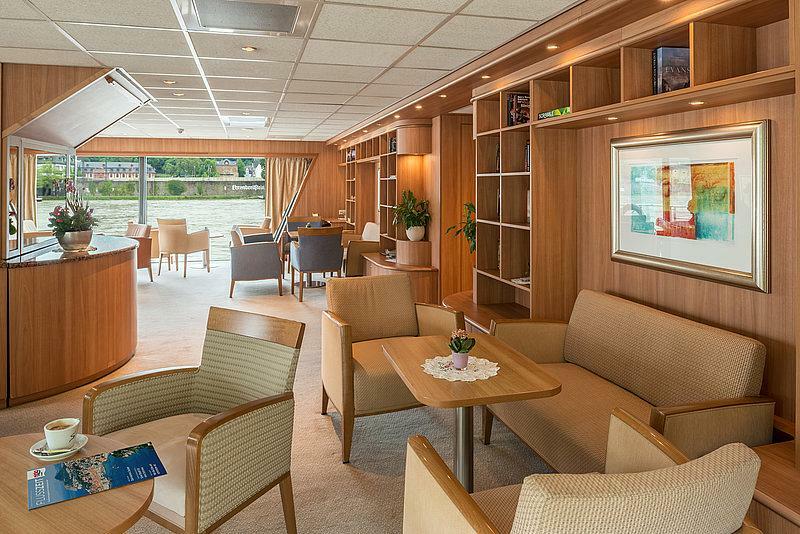 All cabins are outward-facing and have a window, TV, radio, minibar, safe, hair dryer, air conditioning, shower and WC. All cabins are outward-facing and have a panoramic window, TV, radio, minibar, safe, hair dryer, air conditioning, shower and WC. 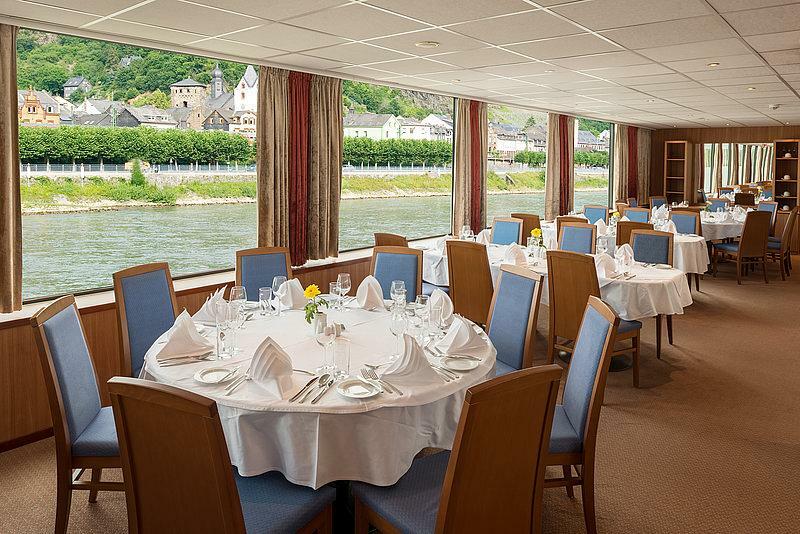 Modern meets comfort on board the MS Rhein Symphonie. 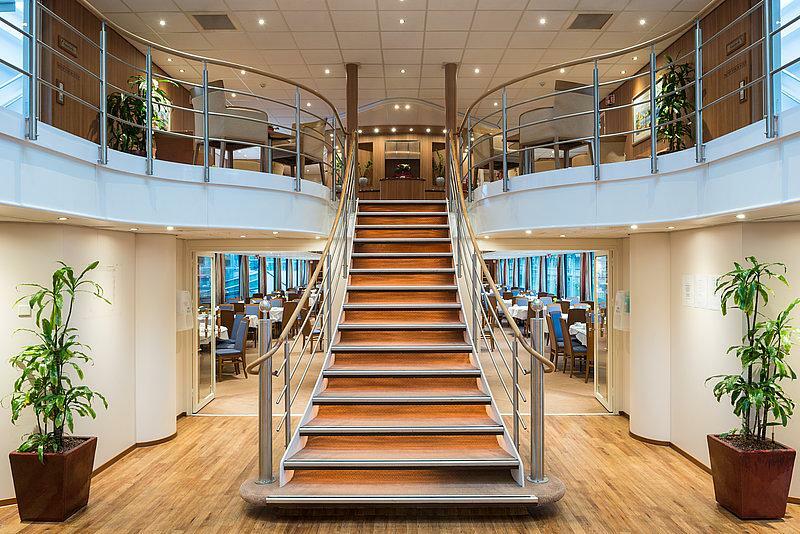 This comfortable riverboat with high demands in design extends over a length of 132 metres. Large panorama windows open a fantastic river cinema even at the restaurant. The cabins are furnished in style and comfort with an air conditioning system/heater that can be regulated separately, shower/WC SAT TV, telephone, hair dryer and safe. The cabins have an approx. size of up to 15 m2. They offer beds positioned next to each other that can be pushed apart on request. CANCELLATION: - Individual cabins (up to 6 cabins per booking) may be cancelled free of charge up to 8 months before the first day of the trip; - Group bookings of 7 cabins or more may be cancelled up to 8 months before the first day of the trip at a cost equal to 75% of the travel price; - from 8 month up to 6 months before the first day of the trip the cancellation charge for all bookings for a cabin with breakfast will amount to 75% of the total travel price; - For cancellations of a cabin with breakfast made 6 months or less before the first day of the trip, a cancellation or no-show charge equal to 90% of the total travel price will be payable. PAYMENT: The total travel price inclusive of all incidental costs is due and payable 6 weeks before the first day of the trip unless otherwise agreed. KD requires a down payment of 10% of the accommodation price on receipt of the booking for group bookings of 10 or more cabins. The balance is due and payable 6 weeks before the first day of the trip. The MS Rhein Symphonie is "scheduled" centrally at the berth Düsseldorf 1 / close to the Rheinterrasse Düsseldorf. 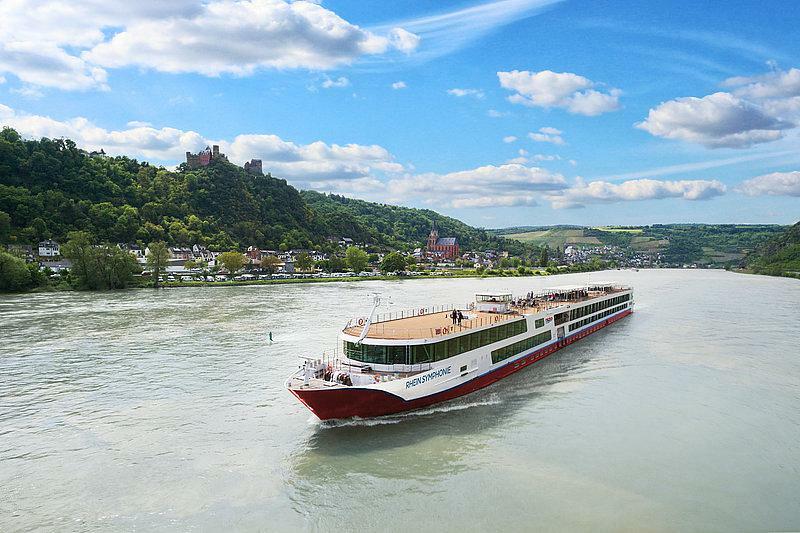 The MS Rhein Symphonie arrives in Düsseldorf on Sunday, November 17 and will be ready for your check in at 2pm / check out on Thursday, 21.11.2019 until 10am. 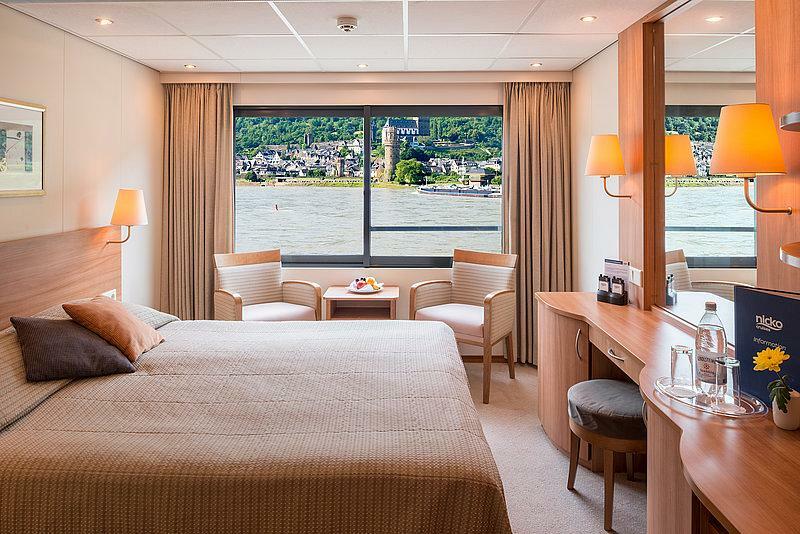 Please note: until 2 weeks before the MEDICA is going to start we are going to send you a detailled arrival description and contact data aboard the hotelship. If arriving by car, please enter the Rheinterrasse Düsseldorf address in your navigation system: Joseph-Beuys-Ufer 33, 40479 Düsseldorf. The pier is directly behind the Rheinterrasse and displays the name “Düsseldorf 1”. If arriving by public transport, you can take any underground train (U-Bahn) going in the direction of Oberkassel from Düsseldorf’s main railway station (Hauptbahnhof). Get off at the Tonhalle/Ehrenhof stop. From here, it is about a 10-minute walk to the pier behind the Rheinterrasse Düsseldorf – Joseph-Beuys-Ufer 33, 40479 Düsseldorf. By car: please enter the following address in your navigation system or give it to your taxi driver: D-40474 Düsseldorf, Am Staad (Stockumer Höfe). By public transport: from the Victoriaplatz/Klever Straße stop (approx. 7-minute walk from the hotel-ship) take the U78/U79 underground train to the MERKUR SPIEL-ARENA/Messe Nord or Messe Ost/Stockumer Kirchstraße. From there it’s just a few minutes to the exhibition centre.